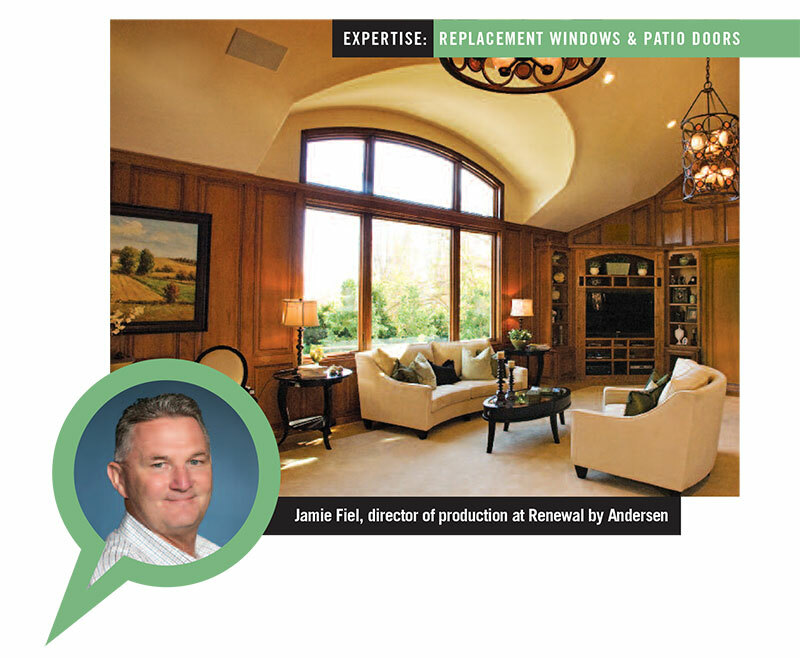 Jamie Fiel, director of production at Renewal by Andersen, has been on job sites his entire life. As soon as he was old enough, Fiel went to work full time building high-end homes with his father and two brothers. Fiel eventually decided to branch out on his own and went to work at a small window and door company in Lancaster. In 2009, he made his way to Renewal by Andersen. “Andersen is the only big company that I’d ever considered working for,” says Fiel. “Throughout my many years building homes with my dad, Andersen was the absolute best company to work with, and they had the best products.” Renewal by Andersen is the full-service replacement window division of Andersen, a 115-year-old company with a reputation for excellence in window and patio door craftsmanship. We recently spoke with Fiel about Renewal by Andersen’s installation process, what it takes to be a great installer and what he enjoys most about his job. What skills do you use today that you acquired building homes? Just like the many different homes we built, at Renewal by Andersen we handle many different types of window and patio door installations— from very basic to intricately detailed jobs. My dad taught me how to ensure each job has the appropriate materials and properly skilled installers. A huge part of our business is putting the right people in the right places. I imagine many of your customers have a nervous excitement when you first show up at their home. There’s definitely some anxiety. And I understand that. We’re entering their home to do construction work. The first thing we do is assure the customer that we’re there to take care of their home. We treat their home like it’s our own. You have to have a great personality if you want to be one of our installers. In our eyes, a first-class installer has all the skills, including being very good with people. We get a lot of feedback from our customers telling us they had fun and really enjoyed our installers. What is Renewal by Andersen’s installation process? When our installers show up at the home, the crew chief will introduce himself and the crew. Then, he reviews the contract with the customer to ensure everything is correct. We always ask the customer where they’d like us to start, just in case they have any special needs. We make sure everything stays clean by moving drop cloths from area to area as we go. We’ll drop-cloth the whole house if necessary. We vacuum the work area when we’re done and take all the trash with us. At the end of the job, we walk the customer around to each window, show how they operate, how to clean them and then address any concerns or questions they may have. It generally takes us one or two days to get a job done. What sets your installers apart from those at other window companies? A lot of window companies just hire a guy off the street and throw a job at them. Our guys are Certified Master Installers. They go through our system to learn exactly how we want the installation done. They must complete a training program and demonstrate they fully understand our products—including how they’re made—and that they’re able to answer any questions for our customers. If there is one thing you’ll hear from all our customers, it’s that our installers love their job. Our installers are very proud to say they work for Renewal by Andersen. They’re proud to install a quality product, and they feel like they are doing a really good thing for the customer. Your office won Renewal by Andersen’s ‘Best of the Best’ award this year. What’s the criteria? Each year, Renewal by Andersen recognizes the best affiliate in the nation with their ‘Best of the Best’ award. Winning the award means we were No. 1 in Homeowner Satisfaction among over 100 affiliates nationwide. And that’s a reflection of the all the great people I get to work with and the hard work they put in every day.